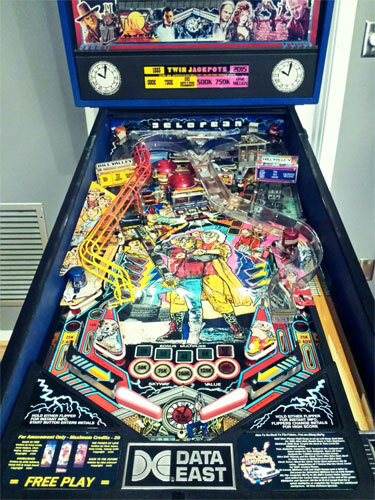 Check out these Back To The Future Pinball Machines For Sale by Data East 1990. You will also find parts and accessories for current owners including the rubber ring kits, decals, ramps, manuals, translites, flyers, and sling shots. Based on the Back to the Future trilogy, this rare game (3000 units) features three songs that were featured in the movies: The Power of Love and Back in Time (Huey Lewis & The News), and Doubleback (ZZ Top), as well as the popular Back to the Future Theme. Michael J. Fox refused his image to be used on the backglass, so the replacement image has a fake Marty McFly. Great Scott!